Do you just eat the broccoli raw or what? 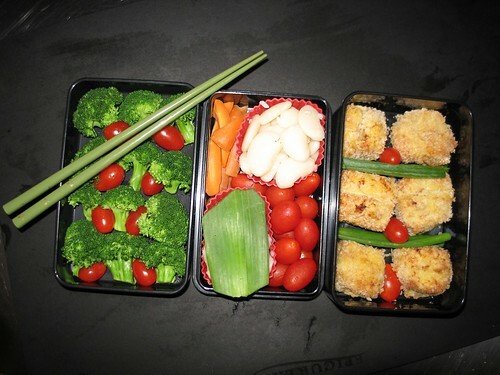 Do you use a cookbook for these bento boxes? Sorry to be so nosey. It's just so interesting. Wow, yes sir yes sir 17 bags full! I know that intermediate place where it's still chaotic, and yet kind of empty-seeming. It's a good sign, though! You're in it! And I can talk about bento all day. Heh. You may be sorry you asked! No recipes in particular, though not surprisingly, Japanese-type foods are a great place to start--sushi, rice balls, etc.
. The broccoli--most of my "in the lid" veggies--are lightly steamed, then thoroughly cooled before closing the box; condensation can be a problem if things going in aren't cool and pretty dry. The main ideas to get started with are: a) Two-thirds starch and one-third protein in the main compartment, with veggies stuffed in the cracks. If you have a second tier: vegetables, fruit, denser salad type things, pickles, and like that. b) the millilitre capacity of the Japanese style box will equate to the calories in it if you stuff it pretty tightly in the ratios mentioned, with no zignificant fats or sugars (which I've found to be true). c) Stuff the box tightly so things don't shift around in there. It's really kind of fun!